46mm Airsal cylinder head for Puch e50 and za50. Super big fin for ultimate cooling power. 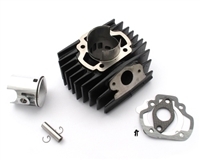 Grab the matching 46mm 72cc cylinder kit! Gigantor 46mm 72cc Airsal cylinder kit for Puch e50 and za50. Super big fin for ultimate cooling power. This is the largest kit you can fit onto a Puch engine without boring the case! Massive intake and exhaust ports with 4 auxiliary boost ports. NOS kreidler head for your kreidler engine. 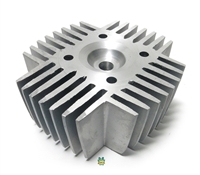 Puch 50cc high compression cylinder head with the old style fin pattern. 70cc 46mm super deluxe cylinder head for MBK av7 and av10. This version comes with a hole for the decompression pin. New old stock cylinder head for Jawa 207 engines. New old stock Jawa cylinder for the 210 engines. Crazy czech tech porting on these! 74cc paramakit head for 47mm moby kits. custom cut squish 45.5mm head specifically designed for the yamaha QT50/YT60/SG50/MJ50 malossi kit! that's right, the squish angle is spot on for the unique dome shape of the malossi piston. NOTE! due to the unique shape of the malossi kit piston, you will need some spark plug index washers to space the tip of the plug away from the dome of the piston. we found that the thickest of the index washers works well! NOTE! this head uses standard short thread plugs. here at long last is the yamaha QT50 yamahopper kit! it's a 70cc 45.5mm cast iron kit. originally made for the yamaha STING SG50, this actually fits perfectly on yamahopper QT50, TRI ZINGER YT60, TOWNY MJ50 and i believe the PW50 as well. 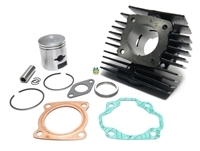 comes with everything pictured, cylinder, piston, ring, wrist pin, clips and gasket set. get a hi compression head here! If you want to use this head, be sure your spark plug is the correct model. this head uses short plugs like these. do not use the wrong plug length AND check and recheck your squish and the spacing before you run this head with this setup. or suffer the consequences. the stock head is totally usable on this setup as well, it is all in your hands, don't destroy your new kit. check everything out before you run it and destroy it. if you don't have a lot of experience with spacing things out use the stock head for now. also probably a good idea to read this thread to get some more ideas on spacing and necessary modifications. woaooh.. 45mm cast iron cylinder kit for the many suzuki FA50, FZ50, FY50 and FS50 moped noped thing! Custom cut and sandblasted puch magnum head. This is a stock head that was cut for higher compression with a 1mm squish. Engine mount/swing mount bolt for motobecane av7 motors. Get some head spacers for it here.